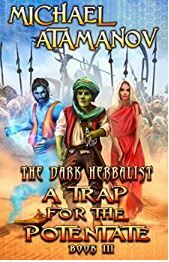 This is book 3 in the Dark Herbalist series with Amra, the goblin herbalist, and his plotline testers. Continuing after book 2, Amra has turned his sights to defeating the challenging quest to go to the end of the river Styx – a challenge that no group of players have yet won. Along the way, several plotholes open up very wide as Tim has to deal with real world enemies as a local gang takes out a hit on him and he loses his girlfriend early in the book when she completely disappears from the story. The ending – and so far there isn’t a fourth book, but it can’t possibly be done – is far too quick and leaves a lot to be desired. Now that I’ve read three LitRPG books, all from Michael Atamanov, I’ve decided on two important conclusions: First, I really don’t think Atamanov is doing a good job writing a story. It’s completely possible that the fourth book will solve many of the outstanding issues, including, importantly, why Amra wins at everything. But I’m not sure that’s the case. He writes women like caricatures of Instagram models. They are there to be beautiful (every woman is) and interested in him (every woman is), while whining and complaining (every woman does) the whole time. There isn’t a three dimensional character in the book. Maybe his AI online girlfriend, Tiesha. Maybe. Second, I like LitRPG and am totally feeling the itch to play RPGs. I’ve started another author’s LitRPG and am looking for others. There has to be a good LitRPG author and story. I’m a huge fan of Sword Art Online (season 1, especially), so I know this is possible. If there is a fourth book, I’ll read it just to see if things wrap up. But I have low expectations right now.